A group in Boca Raton gathered for the anniversary of the Sandy Hook shooting. 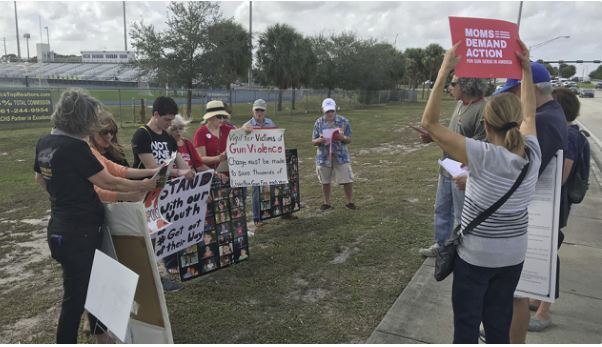 BOCA RATON, Fla. — A group in Boca Raton gathered for the anniversary of the Sandy Hook shooting. Six years ago, 20 students and six adults were killed at Sandy Hook Elementary School in Newtown, Connecticut. Groups in support of stricter gun control held signs along Glades Road in Boca Raton Friday afternoon. "We don’t need assault weapons in this country," said Betsy Pickup. Gail Schwartz lost her nephew in the mass shooting at Marjory Stoneman Douglas High School in Parkland back on Feb. 14. She said her organization, Ban Assault Weapons Now, is planning to put a citizen initiative on the 2020 ballot asking for a ban on assault weapon sales. "I feel that Florida is ready for a change," said Schwartz. The MSD Safety Commission is pushing for stronger school security, which includes allowing teachers to carry guns. It's part of their investigation into the Parkland shooting. "Adding more guns and arming teachers is not the answer," said Rabbi Barry Silver. Instead, the groups would like to see stronger gun control, which they believe could help prevent another mass shooting. "We have to remember them and educate one another," said Pickup.